The ROKiT World Seniors Snooker Tour is pleased to announce that Carl Whitby, Ian Wagstaff and Nick Harry have been invited to join Michaela Tabb in officiating at the Sheffield Masters in the Crucible Theatre on Thursday 11th April. The ROKiT World Seniors Sheffield Masters takes place on Thursday 11th April and features legends of the game including Stephen Hendry, Jimmy White, John Parrott and Ken Doherty. The event is broadcast live and exclusively on Freesports and tickets to attend can be secured by calling 01142496000. 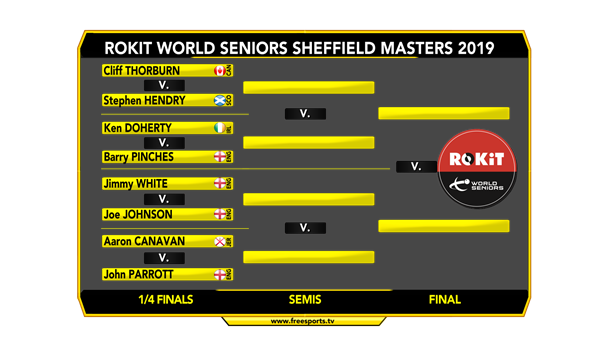 The ROKiT Sheffield Masters is only 13 days away – who wins in the Crucible? At www.snookertv.net we will be following all the action at the Gala Dinner on Wednesday 10th and as we build up to the event inside the crucible on Thursday 11th plus as soon as the matches are played we will get them uploaded into our library… if you still haven’t got an account you but still can today FOR FREE. Nothing beats living the action as it happens at the Crucible, but if you really can’t be there, here is your chance to catch up!